I first saw the earth  the whole earth  from the shuttle Challenger in 1984. The view takes your breath away and fills you with childlike wonder. An incredibly beautiful tapestry of blue and white, tan, black and green seems to glide beneath you at an elegant, stately pace. But youre actually going so fast that the entire map of the world spins before your eyes with each 90-minute orbit. After just one or two laps, you feel, maybe for the first time, like a citizen of a planet. Kathryn Sullivan has the explorers hunger to be where the action is  to see for herself what few others are able or would dare to experience. Her extraordinary career as a deep-sea researcher and astronaut led to leadership positions at the National Oceanic and Atmospheric Administration (NOAA) and now at Center of Science and Industry (COSI) in Columbus, Ohio, where she serves as president and CEO. For her diverse accomplishments, Sullivan has received many honors and on May 21, she added another to the list. The National Science Board presented her with its Public Service Award for her work as an explorer, science museum educator, and role model for women and girls. On May 21, the National Science Board awarded geologist and former astronaut Kathryn Sullivan its Public Service Award. Photo courtesy of the National Science Board. Sullivans odyssey through the world of science has been full of unexpected twists. She entered the University of California, Santa Cruz, intending to study languages and linguistics but found her earth science courses so fascinating that she changed her major. In 1973, after receiving a bachelors degree in geology, she began doctoral studies in oceanography at Dalhousie University in Halifax, Nova Scotia. As she was completing her Ph.D., she learned that NASA was preparing to select a new class of astronauts and, for the first time, would train women for space assignments. Although women had been admitted to the Mercury 13 program in the 1960s, the United States had never sent a woman into space. Deep-sea research of the Mid-Atlantic Ridge, Newfoundland Basin, and fault zones off the southern California coast had taken her as far from the heavens as it was humanly possible to go. But the chance to see Earth from space was irresistible and without a moments hesitation, Sullivan applied to NASA. From 6,000 applicants, she was among the first six women selected for the 35-member astronaut class in 1978. Aboard the Challenger in 1984, Sullivan made history again by becoming the first American woman to walk in space, conducting a three-and-a-half hour experiment to demonstrate the feasibility of satellite refueling. When Challenger exploded on January 28, 1986, Sullivans upcoming mission, scheduled to launch that summer, was cancelled. Four years would pass before she went up in space again, this time on the Discovery to help deploy the Hubble Space Telescope. By the completion of her third mission in August 1992, Sullivan had logged 532 hours in space but felt increasingly disengaged from Earth. 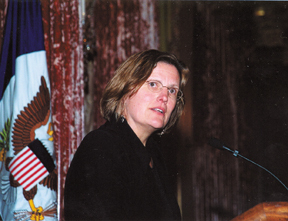 A few months later, she accepted the position of chief scientist of NOAA, where she oversaw an array of environmental research and technology programs that focused on climate and global change, marine biodiversity and satellite instrumentation. Her experiences at NASA and NOAA made her uniquely qualified to serve as co-host of the JASON Project, a live telecast expedition that took students and teachers to outer space via NASAs Johnson Space Center in Houston and to ocean depths through NOAAs Aquarius Underwater Laboratory off the Florida Keys. Working with teachers and students, she discovered, was as rewarding as research. So perhaps it is not surprising that Sullivan accepted the top job at COSI, an interactive museum that has won awards for its innovative education programs. Upon arriving in 1996, she plunged enthusiastically into another big undertaking, overseeing the construction of the museums new state-of-the-art exhibit facility, which opened in 1999. COSI, like its director, has been credited with a number of firsts. Overnight camp-ins for girl scouts began there 32 years ago; during Sullivans tenure, the museum became the first to design an area tailored to the learning needs of young children. KidSpace is now licensed to other science centers in this country and overseas. And new activities are always in the planning and development stages, such as the recently opened little kid space for babies and preschoolers. Childress is a former managing editor of Geotimes and now works as a freelance writer in Washington, D.C. Previously, she wrote about Sullivan in the December 1996 Geotimes. E-mail her at janochil@aol.com.